As I posted recently, SPUF had a “Demoknights vs. Demomen” event, where we pit 9 demomen against 9 demoknights in three different gamemodes to see who wins. The result; resounding Demoknight victory, just like last time. 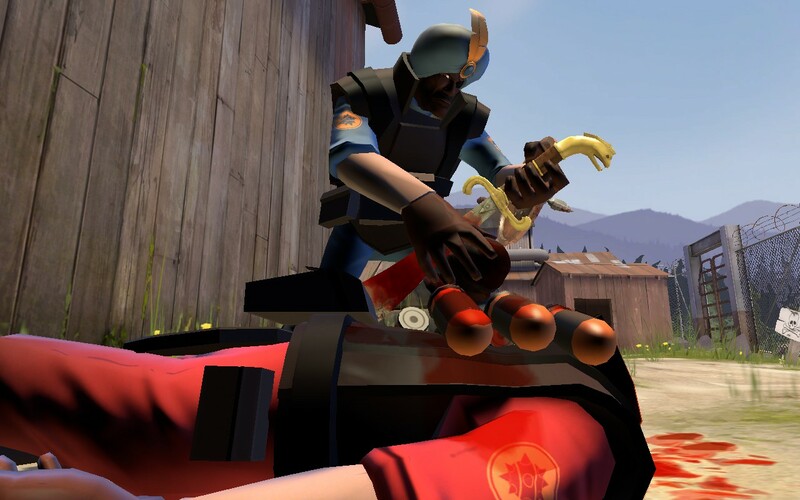 “They’re going to have to glue yer head back on, IN HELL!” Picture by hawkshadow471. pl_badwater: Demoknights capped in 6:20, then held off demomen from second point to the end. arena_lumberyard: Demoknights win 3 times in a row. Then the demomen team up and work together and defeat the demoknights in a flawless victory, while James Horner music plays in the background and the corpse of Walt Disney sheds a single tear. You can see video of the yukon and badwater stretches of the event here, courtesy of Regorek, who was on the Demoknight team.